elcome to my contemporary manuscript illumination web site. I'm an artist who specializes in 15th century materials and techniques of panel painting and manuscript illumination. 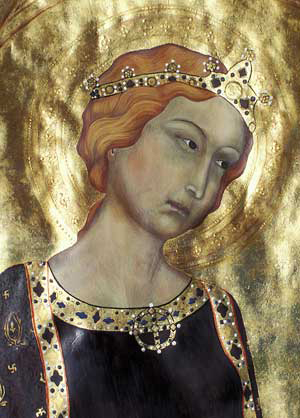 The original painting is gold leaf and tempera on panel. Simone Martini (1284-1344) is one of small number of artists known to have mastered both panel painting and manuscript illumination. Working from the original panel painting hanging in the National Gallery of Canada, I recreated Simone Martini's St. Catherine using illuminated manuscript materials and techniques. This has given me a better understanding of how to adapt painting style to accommodate differences in size, support, and medium.